Hello and welcome to Colins Bees in Ceredigion / Cardiganshire West Wales. Honey Bees are fascinating insects and I am always seeking to understand them better and to support their wellbeing. 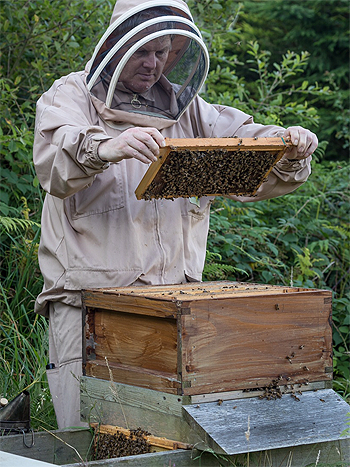 As with All good, ethical beekeepers Colin works with the bees, keeping their hives in remote areas, away from sources of pollution, and uses natural, traditional beekeeping methods. The honey that bees produce is something very special and should be made available for everybody to enjoy. All of the honey that my bees produce is made in the Cardiganshire / Ceredigion area from the wide variety of flowers and flowering trees that this county has in abundance.